There may be no equine commandments or official written rules of watering horses. Different sized animals crave and require different amounts of watery fluids. RULES OF WATERING A HORSE: On average, horses drink up to 25 gallons per day. So, healthy equines need fresh safe drinking water daily and in large quantities. You may be teaching (or learning) proper horse care and stable management. If so, following these ten top tips and points of safe rules of watering horses and ponies is certain to make your equine healthier and happier. The first and most basic rule of watering horses is to provide them with constant access to clean, fresh water at all times - including pastures and stall. Typically, this means every day of every month whether they are in their regular stable or away from home. Drinking fluids helps equines stay hydrated and healthy because water assists digestion of their food. Standing water soon becomes unpalatable so you should change it at least two times each day. Remember that leaf litter makes potted water very dirty and undrinkable extremely quickly. In the hot months standing water becomes a breeding ground for mosquitoes and other pests which may cause diseases. If your horse or pony drinks from a running stream you should check their footing. Horses can get stuck in the mud if it is extremely deep so a better solution is supplying them with buckets or troughs. Remember the stream needs to be flowing. Stagnant water is dangerous for your horse's health. Section them away from streams which are not running. Despite not having to clean out a local stream as often as your buckets, you may need to remove human garbage and dead organic matter on a regular basis. Removing large branches and tree limbs will also lower the risk of your horse or pony getting stuck. Standing in a babbling brook can be good for your horse's feet. But, you should only allow it in small doses because soaking for too long actually softens their feet. You should be familiar with flooding and extreme storm procedures. Make sure your riding rings, pastures, and stalls are well drained. As a rule, the daily amount of water that a horse or pony will drink depends on its breed, size, age, and other special requirements. But, generally somewhere between 10 and 25 gallons is not uncommon. This could mean watering your horse before feeding at least 6 times a day in the summer and 3 times a day through the winter months. Drinking too little water puts your horse at serious risk of colic and laminitis. Water quantity rises during hot weather and drops during cold weather, especially if it is not kept warm enough (thawed). You can encourage animals to drink more fluids in winter months by feeding horses with salty food. Note: Soaked beet pulp contains high levels of salt which helps to trigger their thirst mechanism. Fresh grazing pasture contains 60-80% moisture. Thus, it provides a large amount of the horse's water requirements. Hay and grain are very low in moisture encouraging the horses to drink more water. Higher levels of protein and sodium in their diet increases their urinary volume and hence, water requirement. All water containers should be kept clean and hygienic. Make sure green algae does not develop on the buckets, troughs or automatic horse watering systems. Clean them regularly using a scrubbing brush. Using a hose system to fill up the water troughs means there is no need to carry buckets. But, check that the float system works properly. If you use buckets, make sure they are tightly secured so the horse cannot knock them over or get his feet and hoofs caught in the handles. Beware that heated buckets need to be insulated. Electrical cords need securing far away from the reach of horses and ponies to prevent electrocution. Providing them with ambient water temperatures above 85° F will increase a horse's drinking frequency and volume. Colder temperatures (below 45°F) reduces their water consumption, as a rule. Frozen ice blocks tend to numb their tongue so they often refuse 'chewing' icy water. Offer them slightly warm water in winter and also to horses who are hot and tired. 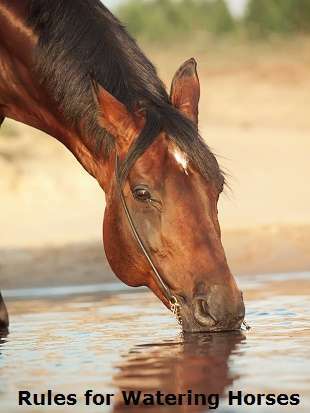 Horses should be encouraged to drink their water with its head and neck in a natural way. This means placing their trough or container at a normal head height or slightly lower. Forcing equine to drink water in an unnatural position can lead to choking and respiratory problems. Physical activity performed or illness can affect the amount of water a horse or pony needs. Horses will sometimes become dehydrated due to heavy sweating. Their body salts should be replaced by adding electrolytes to their water or food. Sick horses with excessive water losses such as from diarrhea require more water per day. Breeding stallions, and pregnant or lactating mares require 50-80% more water per day for milk production compared to horses at maintenance. Let performance horses drink water before and during prolonged activity. Let them cool down adequately before any free-choice drinking after vigorous exercise. As a rule, start at the front feet and work up slowly when you are giving your horse a bath. Make sure the temperature of the water is not burning hot or freezing cold. Never use water as a punishment in any way. On most cases, you should not ride a horse in water unless you can see the bottom. Discourage horses from drinking copious amounts of water after a hard workout. Instead, dismount and loosen your girth (or remove the saddle) and give your horse a relatively small drink before finishing un-tacking. If you walk him to cool him down he should have stopped blowing, panting, and puffing. Hose or sponge the sweat off if it was a particularly tough work out. Once he is breathing normally you can put him in his stable or the field and allow him the normal access to his water supplies. Horses in the Road: Check out the safety rules for riding a horse on the roadways. Equestrian Crossings: Learn how to use Highway Code road crossings for horse riders. Fox Hunting Rules: A guide about the laws for hunting foxes in the United Kingdom. Horses on Farms: The legal requirements of having horses on farms and in livery yards.